The Big Bend along the Gulf of Mexico is the least developed coastline in the lower 48 states, 150 miles of fishing villages and stands of coastal forests, a slice of Old Florida forgotten by real estate booms. 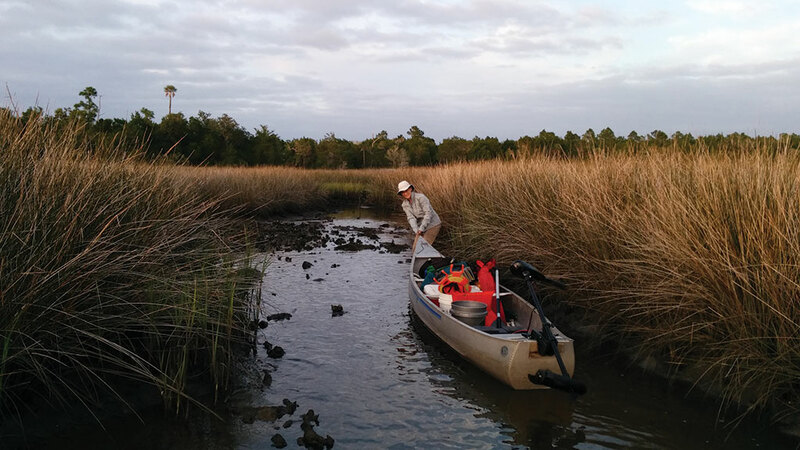 The limited influence of humans makes the Big Bend an ideal natural laboratory, and University of Florida researcher Jack Putz has studied its coastal forests since 1992. In 2014, he handed his data over to doctoral student Amy Langston, who quickly came to view the area as a treasure. “This area is ripe for research on climate change,” says Langston, who works with adviser David Kaplan in the Center for Wetlands and is a student in UF’s Engineering School of Sustainable Infrastructure and Environment. “This area is so protected, so naturally preserved. Here we can study the effects of climate change — sea level rise, changing temperatures, storm surges, increased frequency of storm events and more extreme weather events — without the confounding effects of human influences. We can see how climate change naturally affects the coastline. “We don’t have many spots where we can see the effects of climate change on natural landscapes, so that’s definitely a treasure,” Langston says. For a state that gets more than 800 new residents every day, it might seem that condos and roads, golf courses and shopping centers would be the main threat to coastal forests, but Putz says the killer of acres upon acres of trees in this region is salt. “Tree deaths are really widespread up and down the coast, and the fact that the forest is retreating so rapidly is an issue,” Putz says. Putz was pulled into coastal forest research in 1992 when a plastic surgeon with a vacation home near Yankeetown called him. The doctor wanted to know why his palms were dying. Putz and a team of researchers drove over to take a look. When they ruled out insects and diseases as root causes, they expanded their investigation. The researchers established sample plots in which they mapped the trees and measured them, and then tracked what happened. They realized elevation played a role, but they were not sure if the problem was water or salt. Another researcher did a series of experiments with small trees in kiddie pools, varying salinity pool to pool. The research team compared the records from their sample plots with weather patterns and found that peaks in tree mortality were associated with storm surges that were followed by drought. Although the salinity of the Gulf is only about 18 parts per thousand (compared to 32 parts per thousand in the Atlantic Ocean), as the seawater evaporated, the salt concentration increased to the point that no trees could survive. Putz was overwhelmed with his work on tropical forest conservation, so he handed over his Florida coast data to Langston. Langston continued the studies, finding the same accelerated decline in the coastal forests, but added new work, both across a broader landscape and in Yankeetown. With UF’s Conservation Clinic in the Levin College of Law, Langston worked on the science portion of a two-part plan that makes Yankeetown a statewide model in addressing climate change. Yankeetown, population 502, used a 2011 state law that allows towns to consider natural resources in land-use planning to address sea level rise with a Natural Resources Adaptation Action Area. The policy tool allows communities to take into account vulnerability to sea level rise in their development patterns, infrastructure and other resources. Yankeetown already had recognized the value of its natural resources. When the plastic surgeon’s property was slated for development, the town bought it and turned his vacation home into an environmental education center as part of the Withlacoochee Gulf Preserve. “Yankeetown has a shot at adaptation, it’s ahead of the curve in planning,” Langston says. The science team recommended enhanced natural shorelines and limited coastal development, maintaining the preserve and working with adjacent open spaces managed by other groups to provide a natural corridor for upslope migration of people, plants and animals. As the sea continues to rise and coastal forests wither, Langston is looking to the future. Possibly, a northward migration of mangroves. As Langston monitored the forests near Yankeetown, she noticed mangroves popping up — and taking root — in places where winter freezes had killed them before. Warmer winters have led to patches of tropical mangroves along the southern Big Bend coast, with a large population in Cedar Key, she says. Her hypothesis is that the coastal forests may be replaced in part by mangroves, and that mangroves would preserve some of the forests’ ecological functions, such as bird nesting sites or erosion protection. For mangroves, ripped out along other sections of Florida coasts for seawalls, the northward migration could prove healthy, especially since the salt water of rising seas will not hurt them. “These are two very different responses to climate changes, the coastal forests dying and the mangroves migrating,” Langston says. The coastal forests may follow the example of the mangroves and migrate inland, and Putz says some researchers talk about assisted migration. Countless other natural resources important to Floridians face the same challenge: where does a sea turtle nest if there’s no beach, where do panthers roam when the Everglades is under water, how will corals and oysters adapt to warmer or more acidic waters? For the coastal forests, slow to migrate, it’s a keen question. Their life or death is a snapshot in a history-of-the-earth timescale. But those who are here to witness a natural system as it evolves perhaps have a responsibility, Langston says.